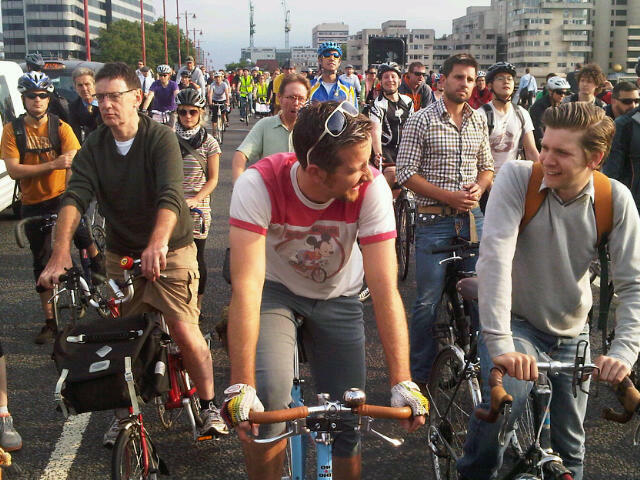 On Friday night, people took to Blackfriars Bridge to protest at Transport for London's anti-cycling and anti-walking agenda. 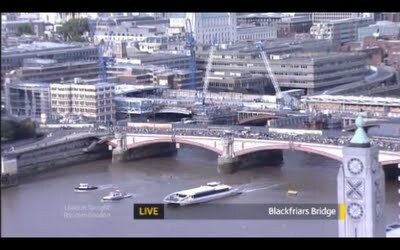 Although there has been plenty of coverage of the event itself, I think the most telling image is ITV's aerial news coverage (with thanks to ibikelondon) - an entire lane of the bridge taken up with people on cycles, all making their point. Possibly as many as 2,000 people. What struck me was just how normal the people were on this ride. If you look at my pictures from the event, you can see people in suits, people in jeans, a few serious racing cyclists. But mainly men and women of all ages. And a couple of dogs. Jeremy Clarkson likes to paint people who use bicycles as 'lycra louts' or even 'anti-capitalists'. But there was no evidence of either on this bridge. Some taxi drivers think that road space should be allocated according to "commercial importance" and give people on cycles zero points for commercial importance. 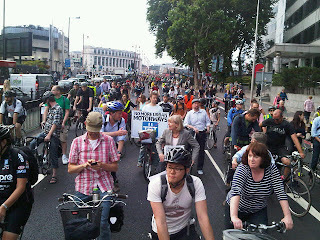 Try telling that to the people wearing suits on this ride who were cycling from their jobs in the City. 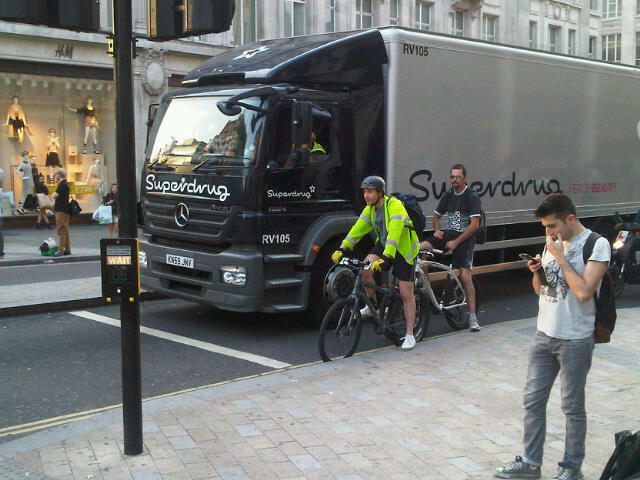 The very same sorts of people who cycle to work also often use black cabs to get about. The concept of people who cycle as 'lycra louts' is getting very old and stale, I think. People who cycle are, well, just people who cycle. That's all there is to it. But one thing set me thinking on the Blackfriars ride. You see, everyone who participated in the ride on a cycle knew why they were there. And thanks to the BBC, Evening Standard and ITV, people who watched or read that night's news knew why as well. But most people aren't quite sure what we're complaining about. My own view is that the issue is not just Blackfriars. Blackfriars is a useful case study for how Transport for London gets it so utterly wrong on cycling. But it's about how TfL and the boroughs think they can simply throw scraps at people who cycle to work or to the shops or in their leisure time and how they design cycling out of London's streets, in favour of designing in speeider, easier streets for people in motor cars. To borrow just some every day examples, look how pedestrians and cyclists are crammed into narrow cow-pen crossings at Vauxhall. There's not enough room for all these people to get to the crossing and that results in a conflict between people on foot and on cycle, all of whom are squeezed into a narrow crossing, with very long waits between green phases. That's because what counts here are people in motor cars, not people on foot or cycles. Motor vehicles have up to six lanes in each direction at Vauxhall, they have overwhelming superiority in terms of green light phases. TfL's mission to 'smooth traffic flow' is meant to apply to all users of London's roads - on foot, on cycle or in a motor vehicle. But on the ground, it's clearly only motor vehicles that count. Or take a look at how even brand new road schemes simply don't think about people on cycles. In fact, they often actively design safe and convenient cycling out of our streets. Here on Oxford Street, the road has been narrowed forcing cycles to sit in a tiny gap next to HGVs and buses. A perfect recipe a) for warding people off cycling in London in the first place and b) for risking far more serious collisions. It's the same all over London, whether in the Square Mile or in Bloomsbury. There are plenty of much worse examples than these. And they are all over the country, not just in London. It's not because the UK is incapable of building safe and convenient routes for people to cycle and walk. We are very good at deciding what should and shouldn't have prioity - only last weekend, for example, the Embankment was closed for a cycle triathlon event. No cars allowed and no protest about it either. But the fact is there is absolutely no political will to make it safe and convenient for people to choose to cycle or walk instead of drive. As I said last week, the policy makers, the politicians, the transport authorities don't want to give people a choice not to drive. And they make this explicit by designing streets that don't work for people who would like to cycle or walk. Instead, they design our streets solely around the priorities of the motor vehicle in the misguided belief that people are less valuable on foot or on a cycle than in a motor vehicle (I kid not, see this link). The fact is that people who choose (or would like to have the choice) to walk or cycle are no more or less valuable than people who choose to use a motor vehicle. But we have policies that design those choices out of our streets. I think it's time that people who cycling and walking to have equal status on our streets start demanding that things change. That our streets start to be designed to give space and time to people who cycle and walk. In 1982, the House of Lords debated congestion. A view put forward in that debate was that the only way to defeat motor congestion is to "make motoring short distances in London so disagreeable and expensive that people stop doing it." And the unfortunate truth is that means taking some space away from motor vehicles. Or at the very least, slowing motor vehicles down enough to create streets that start to feel safer to cycle and walk on. If we're going to get there, it needs more than a small private army of a couple of thousand people on bikes on a Friday afternoon. It needs tens of thousands of people to make the point. Again and again. So that everyone realises they know people like them who agree and think this should be done. I think that a major push by people who want cycling and walking to have equal status in our towns is coming. And I look forward to participating in it. I hope you are right! 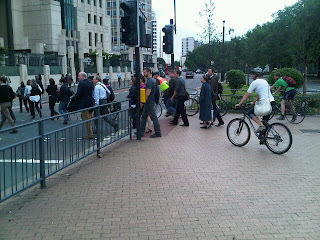 I attended the demo on Friday at Blackfriars (though I was 20 minutes late - still got to work you know). What did annoy me was the large amount of cyclists riding away from the area - I almost felt like stopping and asking them to spare 30 minutes of their time to help make their ride home better in the long term. Then again - having never been in any form of demonstartion in my life - I was not a natural! It took a lot of self convincing to make myself turn up. I think everyone who did turn up needs to get one person from their office or neighbourhood to turn with them next time. 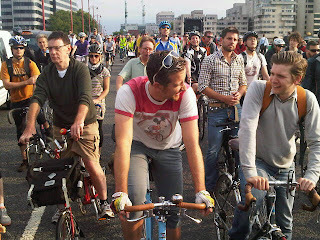 I, like you, feel that Blackfriars needs to be the cyclists Alamo. You're very right. There's a world of cyclists, and then there is everyone else - people are not aware of what's going on. I like to think that putting information boards on Blackfriars Bridge and getting some articles in Metro or some such. There are many orgs that should be interested too. Absolutely, this isn't about Blackfriars so much as the wider issue of making the streets fit for human life. We don't have to go as far as the often-quoted Dutch model with segregated bike lanes and all that. Very nice in its way but it would never work in London, for space reasons and because we like a bit of anarchy, but it really is time to shift the balance away from traffic. duncan - rubbish - there's plenty of room for segregated bike lanes in london - all you have to do is take a little space away from private cars. (and what's all this about anarchy? the british hate anarchy. they do tend to be a bit small-minded and conservative from time to time. like the mayor..
Road narrowing in my view benefits the cyclist, making it easier to 'take the lane'. I agree with your wider point, though: Blackfriars is indicative of a lip-service-at-best attitude to cyclists in London that no amount of blue paint is going to cover up. Before things in Copenhagen changed back in the 70's congestion was pretty bad like many other cities. Cyclists came together in a large focused protest (2000-3000) and demanded improved conditions. That was a turing point. With a little hard work and campaigning we can get 10,000 to protest in Trafalgar Square to kick start the change required. Once politicians realise its a vote winner, they will begin to listen. Coupled with more direct action such a the Blackfriars protest we will begin to make the case for a London Bicycle Master plan that includes segregation where ever physically and financially feasible. The time is now.